At the Dickens Christmas Fair 2006, Lisa (middle daughter) was tempted by the corsets at the Dark Garden's storefront. She knew about Dark Garden because her sister, Rene, had bought one and Rene has waxed enthusiastic about how wonderful the Dark Garden corsets are. But as Lisa didn't want to spring for the cost of the corset at that time ... and neither did I ... we left the storefront without, although, we kept thinking and talking about it! I didn't want to make the purple-and-gold brocade corset right off because if the newly redrawn pattern wasn't right, I was up the creek without a paddle ... and Lisa would be bereft of a corset. So, another test corset was needed. Fortunately, I had a corset that I never finished from my corset class ... in fact, I really hadn't come close to finishing it. I was able to salvage quite a few pieces from it for the test corset for Lisa and then cut the remaining other pieces. The tropical fishie fabric was leftover from a long abandoned quilting project .... this fabric has been used in many different projects! 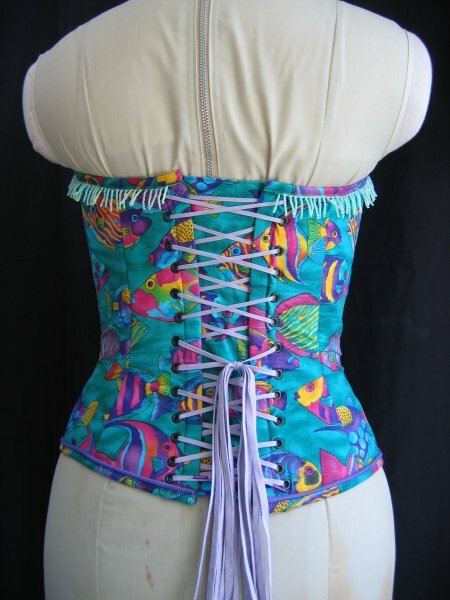 This test corset has 3 layers: fused woven interfacing to the fashion (fishie) fabric; cotton drill 40 with boning channel tape for stability and a vibrant purple cotton lining fabric. 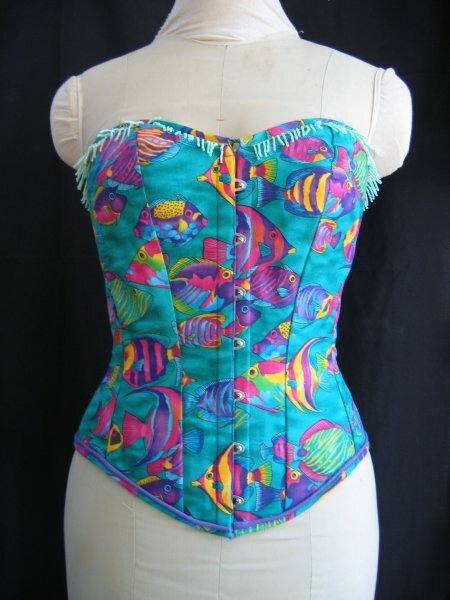 When I was cutting this fabric out for my second class corset, I hadn't been thinking about matching any design motifs. Since the center front pieces were salvaged from the class corset project, regretably, the design isn't anywhere close to matching. Such is life and that's the breaks. I had been able to obtain a copy of "The Basics of Corset Building" by Linda Sparks, which explains in exhaustive detail how to construct corsets in several different construction techniques; in fact, it reinforced the same techniques that my corset class used. One major difference, however, was the manner in which the seams allowances were dealt with. The book says to press the seams allowances to opposing sides (fashion fabric one direction; base layer the other). My corset class has us press all the seams open. The book's technique is one that is used in quilting to enable the fabric layers to nestle in place securely, and although I am VERY familiar with quilting, this wasn't what was taught in my class, so I was suspicious. But ... I decided to give it a try ... it just might work out well and then I'd have two ways of treating the seams. I'd never know if I didn't try it and since this was "just another" test corset, I wasn't adverse to some experimentation. When all was said and done, I don't like the book's method of doing the seam allowances. I found it very bulky and the resultant curve wasn't as smooth as I wanted. But, this was a valuable lesson in any case ... now I know that I *don't* like it ... and the experience wasn't wasted. I will use Carol's open seam allowance method for the purple-and-gold brocade corset. I was somewhat concerned about the boning over the bustline, but spiral bones seems to have solved that problem. Spring steel bones were used elsewhere. For this corset, I didn't want the fashion fabric layer to be marred by the boning channel seamlines, so I chose to float it. Because there are no seamlines visible on the front, it looks very sleek and the fabric motif isn't disturbed. Two part black grommets were set along the back but somehow I managed to misalign a couple of them. [sigh] Clearly, this is an area I need to pay more attention to! We decided to dye the white lacing a dark purple to coordinate with the fashion fabric. Eventhough I followed the dyeing directions about concentrating the dye for dark colors, the lacing came out a lavendar. I'm not sure if I didn't follow the directions properly or if the lacing wasn't 100% cotton. In any case, eventhough the color didn't come out as we had envisioned, we decided that the lavendar is just fine. A modesty panel was sewn to the inside of the back. As an extra element of decoration, we found some pre-made beaded fringe at Joann's which coordinated with the colors in the fishie fabric. This fringe was sewn under the top binding. A green ribbon was threaded through the channel created by the top binding so that the neckline can be snugged up a bit, if required. 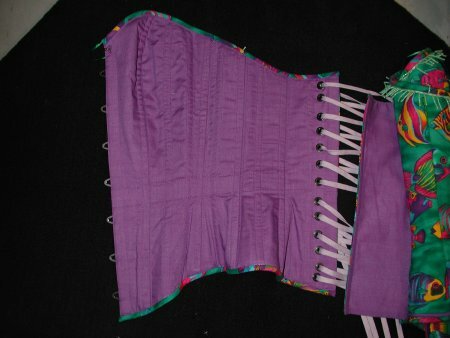 The bottom of the corset has purple piping sewn along with the bias binding. Now that I know the sweetheart neckline fits Lisa nicely, I have more confidence to cut out the purple-and-gold brocade. We've already chose a skirt pattern and skirt fabric to accompany the corset. So, now it's on to THAT project!